McALLEN — A former state judge accused of bribery wants to delay his trial until next year. 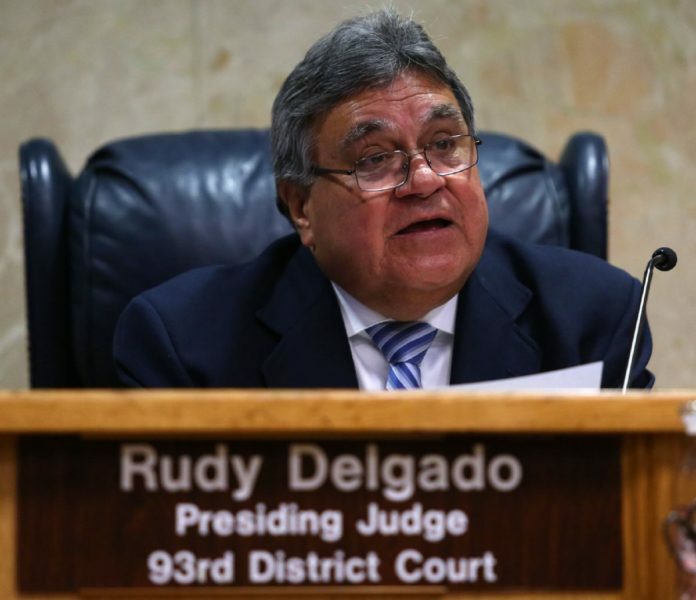 Citing more than 3,600 pieces of evidence, and recently filed charges, the attorney for former state District Judge Rodolfo “Rudy” Delgado said it would be “impossible” to effectively represent his client at trial by Sept. 10, the current scheduled trial date, court records show. In a five-page filing Monday, Delgado’s attorney Michael W. McCrum, said he has had several discussions with government prosecutors regarding the volume of evidence related to the case against his client. “Based on the complexity and breadth of the discovery and the nature of the allegations, Defendant requests a continuance of the trial setting,” the motion states. In April, the Court granted Delgado a similar motion for continuance. In that filing, McCrum cited “voluminous documents and recordings” of discovery related to the case, which he still needed to sift through, as well as a mention that prosecutors would be providing more documents at that time. In Monday’s filing, McCrum praised the government’s ability to produce discovery, but also underscored the difficulty in reviewing the voluminous size of the discovery he’s been given. Breaking down the discovery provided to him by the government into “six stages,” McCrum lists examples of the types of discovery produced by the government. In the first stage, the record states the government produced 995 different items, most documents, some zipped files, followed by 1,706 items produced, mostly from 100 discs of data, in the second stage. The record also states that the government gave notice that video surveillance recordings, spanning a period of more than 10 months, are available for production. “Hard drives were delivered to government, and undersigned counsel is now waiting for the government’s production of what is likely to be 14 terabytes of recorded data, consisting of 10 months of video recordings, made at five different locations,” the court record shows. As part of this argument for a delay in the trial, the San Antonio-based attorney says the two newly filed charges against Delgado will further delay his review of discovery. He said that he’s seeking clarification from the government on charges filed on June 19 and July 25, conspiracy and obstruction of justice, respectively, bringing the number of federal charges the ex-judge faces to eight. “For example, the superseding indictment refers to ‘twenty’ instances of alleged bribery, and identifies persons by letter designations (“Person A, B, C”). Government counsel has agreed to provide additional particular information to undersigned counsel,” the record states. The new charge alleges Delgado knew he was under federal investigation for bribery when he sent a text message to “Attorney A,” one person he allegedly took a $5,500 bribe from, making it appear as though it was a campaign contribution. “When Delgado sent this text message, he knew the statements in it were false because he knew that the $5,500 bribe payment from Attorney A was paid in cash when he received it because Delgado knew that the cash was a bribe paid to him in exchange for judicial action, not a campaign contribution,” the new superseding indictment states. In a separate filing also made Monday, McCrum filed a motion to produce sealed material from the gov-ernment. Specifically, the ex-judge’s attorney wants the government to produce sealed material of what appears to be intercepted communications between Delgado and others from a federal wiretap, the court filing states. McCrum states that this specific discovery is “necessary” in order for him to provide effective assistance to his client. The court could rule on the defense’s continuance and sealed material motions as early as this week.